Baton Rougeans often forget that the older parts of their city were a Civil War battlefield. The Battle of Baton Rouge, which was fought on Aug. 5, 1862 left 48 Union and 48 Confederate soldiers dead. 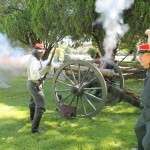 Some of the most intense fighting occurred on the grounds of the Historic Magnolia Cemetery at the corner of Florida and N. 19th St. Last Saturday, the Foundation for Historic Louisiana and BREC held the 32nd Annual Commemoration of that battle. More than 150 local residents, including descendants of those who died, attended. More than 150 local residents gathered at Historic Magnolia Cemetery Saturday, Aug. 1 for the 32nd Annual Commemorative Ceremony of the Battle of Baton Rouge on Aug. 5, 1862. Much of the fighting occurred around the cemetery.The event, which is sponsored by the Foundation for Historical Louisiana and BREC, featured Union and Confederate re-enactors who fired a cannon and rifles, demonstrated Civil War-era medicine, and held a flag-raising ceremony. Members of the United Daughters of the Confederacy placed wreaths on some of the graves. Many of the Union soldiers who died in battle are buried in the National Cemetery next door, perhaps because they fell so far from home, but only a few of the Confederate dead are buried in Historic Magnolia Cemetery, perhaps because Louisiana families were able to retrieve their dead. One of the Confederate soldiers who did die in the battle and is buried there, 2nd Lt. Zachariah Causey, was honored by his great-great-grandson, King Robinson. The history of the Battle of Baton Rouge was told by guest speaker Marvin Steinbach, interpretative ranger at Port Hudson State Historic Site. A link to his remarks can be found at http://centralcitynews.us/?p=10599. The ceremony was dedicated to Ory Poret, former chairman of the Board of Trustees of Historic Magnolia Cemetery. The Louisiana State Militia, 10th Brigade re-enactors raised the colors and fired three volleys. The Battalion Washington Artillery, 5th Company fired a cannon to salute those on both sides of the conflict who gave their lives. The United Daughters of the Confederacy, led by president Sarah Grace Brooks laid a wreath in honor of those who died in the battle. BreAnne Baker sang the National Anthem, Dixie, and Amazing Grace. Magnolia Cemetery was purchased by the City of Baton Rouge in 1852 and is a Who’s Who of prominent citizens of the era.